PDF3D SDK Pro provides a full set of features to support system integrators and software engineers in building systems that need complex and reliable 3D document production capabilities. The SDK software provides for on-premise installs or embedded PDF generation inside deployed applications, in engineering, aerospace, earth science, manufacturing and other demanding environments. With proven capabilities to quickly integrate the PDF3D platform with just a few lines of code, PDF3D SDK Pro lets you spend your development time on product improvements and ship them faster. 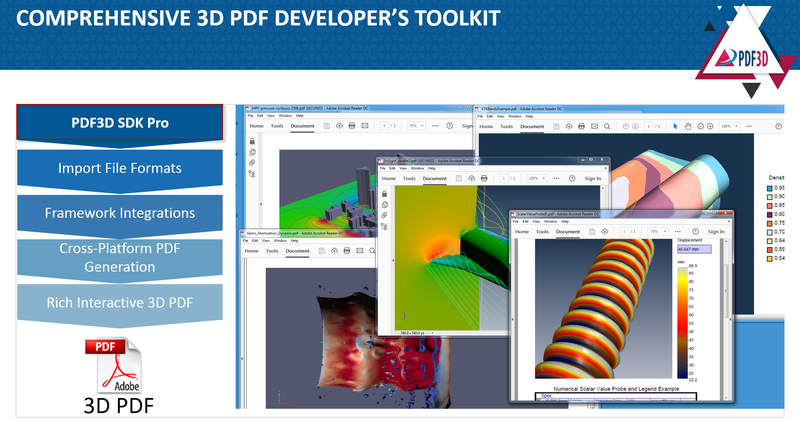 As a brief introduction to PDF3D-SDK Pro, this article covers the Developer’s toolkit for 3D PDF, explaining key features, architecture, documentation & source code samples, and typical applications. The PDF3D-SDK Pro provides a rich high and low-level API with libraries and DLLS to enable developers to quickly integrate 3D PDF support into applications. The toolkit has full in-memory data structure APIs, as well as file format loaders and 3rd party framework integrations. It’s one of the very few APIs where a single library provides both 2D and 3D services, along with auto-generated scene management scripting. By providing multiple access points, the SDK can be used in the most suitable way for your application. The documentation covers all the main methods of the library, the class structures, parameters, and includes an extensive set of small stand-alone source code examples illustrating how to use the library under various scenarios. What can the SDK Generate? Since all the PDF3D applications such as ReportGen and PV+ are based on the PDF3D SDK Pro libraries, it’s possible for application developers to create similar content to these. For the range of possible 3D PDF content, review the samples at https://www.pdf3d.com/all-examples/ , including many sent in by PDF3D customers. For More information see the main PDF3D SDK Pro Product Page. To discuss your app requirements or set up an evaluation, use the Trial Request form.